The old Saxon Abbey church was rebuilt after the conquest of England by its new Norman lords. By 1180 and early Norman cross over Abbey had been completed with a 431 feet (131m) tall spire. After the Dissolution of the Monasteries in 1539 the Abbey was sold to William Stumpe, a rich merchant who filled the old Abbey buildings with looms to make cloth. In 1500 the West tower fell during a storm demolishing three bays of the nave and leaving only half of the original building standing today. The Abbey building fell into ruins which are still attached to the church. Malmesbury Abbey still retains marvellous examples of Norman architecture mixing with the Gothic to create an interior which soars up three stories to a stone vaulted ceiling. Norman geometric patterns surround the first tier arches but little other internal decoration survives apart from the Tomb of Athelstan who was a grandson of Alfred the Great. Athelstan was crowned King of Wessex in 924 and by 927 he had expanded his kingdom to create the Kingdom of all England. In 937 he won a decisive victory at the battle of Brunanburh and defeated the Scottish, Norse and Danish army to become ruler of the whole of Britain. He died in 939 and was buried at Malmesbury Abbey. The most fascinating sculptures are to be found on the walls of the south porch of Malmesbury Abbey. Although incorporated into the Norman porch, these sculpted panels, measuring 10ft by 4ft 6”, are from an earlier date. 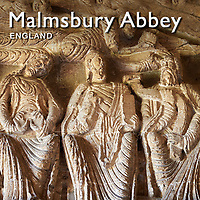 The sculptures of Malmesbury Abbey are in the Roman Byzantine style similar to those to be found at the church of St Peter at Monkwearmouth, which were sculpted by masons from Gaul in 710 for the Abbot of Jarrow. As is often seen in Saxon Manuscripts the apostles are shown seated on a long bench, some of their heads are inclined awkwardly and apart from Peter, none of them carry any of the symbols, used from the 9th century onwards, to distinguish each Apostles, some carry books or manuscripts and, apart from St John, they do not have beards, which only appeared on later sculptures. The flying angels above their heads bear a considerable resemblance to the carved angels of St Lawrence, Bradford-on-Avon, which were probably commissioned by St Aldhelm, founder of Malmesbury in 705. These sculptured panels at Malmesbury are important well preserved examples of Saxon art that probably came from the original Saxon Abbey of Malmesbury.